You have an injury at work. This has never happened before and you are scared. You don’t know your rights. Who should you talk to? What should you do? How will your family get through this? 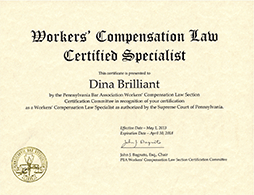 Don't get caught in the complicated and confusing world of Pennsylvania Workers' Compensation without help. Brilliant & Neiman LLC is there to protect workers who have been injured while doing their jobs. Our Pennsylvania workers' compensation lawyers are dedicated to making sure the rights of injured workers are properly protected and their disability claims are accurately handled. Our attorneys do not handle any cases other than representing injured workers in Pennsylvania Workers' Compensation matters. Protecting injured workers is all we do! Both of our attorneys, Dina Brilliant and Glenn Neiman, are among the first attorneys in PA to be Certified as Specialists in the Practice of Workers’ Compensation Law by the Pennsylvania Bar Association’s Section on Workers’ Compensation Law as authorized by the Pennsylvania Supreme Court. Every day of the week, we are involved in the PA workers’ compensation system. This allows our attorneys to have experience and familiarity with the workers’ comp system that a general practice law firm does not. Our clients have already suffered pain and loss from their injuries, and we do not think they should suffer through the law as well. The Pennsylvania workers’ compensation system can be complicated and confusing. Knowing your rights can make all of the difference. Whether an injury resulted in a temporary disability, a permanent disability, or a death, our Pennsylvania workers' compensation attorneys have the skill, experience, and dedication to protect our clients’ rights. The initial consultation is always free and there is no fee if we are unable to get results for you. We understand how intimidating it can be to be thrown into a process so unfamiliar. The PA workers’ compensation system can be thorny and perplexing. Throughout the pages on our website, we have tried to provide useful information to injured workers and their families. Pages on our website have been devoted to what work injuries are, what happens when a claim is denied, what benefits can be available, workers’ compensation settlements, Impairment Rating Evaluations, Utilization Reviews and Labor Market Surveys/Earning Power Assessments. There are also FAQ pages for both the legal and medical side of work injuries. 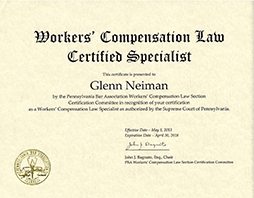 In addition to our website, we take pride in publishing our award-winning blog, at pennsylvaniaworkerscompensationlawyerblog.com, to help educate all injured workers in PA. On this blog, we follow decisions rendered by Pennsylvania appellate courts, medical developments and other issues we think may be of interest to the injured worker. This may be legislative action being taken by the government, or changes within the Pennsylvania Bureau of Workers’ Compensation. We like to think if it is happening in the PA workers’ compensation system, you can read about it on our blog! The law governing work-related injuries is a constantly changing thing – since being instituted in 1915, the Pennsylvania Workers’ Compensation Act has been amended many times, including significant changes in 1972, 1993, 1996, 2006, 2010, 2011 and 2018. Each time, the appellate court system in PA must interpret the law. Obviously, this requires attorneys to stay current on the recent changes, and how these changes are faring in the appellate courts. It is for this reason that our firm limits its practice to only representing injured workers in their workers’ compensation matters. By handling these cases, day after day, our exposure to the PA workers’ compensation system and Workers Compensation Judges is greater than that of a general practice attorney, who may handle such a case every once in a while. We want our clients to benefit from our experience in the system. Sometimes our clients do need legal representation in matters other than workers’ compensation. We take pride in having a wide network of attorneys to whom we can refer our clients. Though our firm does not handle car accidents, family law, employment law, Social Security Disability, or other legal matters, we have relationships with other attorneys, throughout Southeastern and Central Pennsylvania, to whom our clients can be referred and obtain excellent personal legal representation. We represent injured workers throughout Southeastern and Central Pennsylvania. The territory we cover runs as far west as Harrisburg, Lancaster and York. Often, our clients hail from the northern parts, such as Bloomsburg, Wilkes-Barre and Scranton. Given the location of our offices, we represent many injured workers from Bucks County, Montgomery County, Lehigh County, Northampton County, Delaware County, Chester County, Berks County and Philadelphia County. Our main office is located on Street Road in Warminster, PA, a short drive from Lower, Central or Upper Bucks County, or Eastern Montgomery County. We also have an office in Trevose, Bucks County, at Route One (Roosevelt Boulevard) and Old Lincoln Highway. This locale is literally minutes from the Philadelphia/Bensalem exit of the Pennsylvania Turnpike (Exit 351) and less than one mile north of Northeast Philadelphia. Since we are in close proximity to both Roosevelt Boulevard/Route One and I-95, we are only 25 minutes from Center City Philadelphia, and 20 minutes from Trenton, NJ. For our clients in the Lehigh Valley area, including Bethlehem and Easton, we also have an office in Allentown, at 6th and Hamilton Streets, just down Hamilton Street from the PPL Center. Additionally, for the convenience of our clients throughout the region, we are able to meet in Center City Philadelphia, Doylestown and various other locations, as needed. Importantly, those injured workers outside our area of coverage, such as those in Western Pennsylvania, including the Pittsburgh area, are not completely out of luck. Just as we have relationships with excellent attorneys who practice other types of law, we also have relationships with attorneys in the northern and western parts of PA, to whom we can send injured workers. Contact our Warminster and Trevose offices at (215) 638-7500, our Allentown office at (610) 740-1002 to speak with us. We can also be reached by e-mail at gneiman@bnlegal.com or dbrilliant@bnlegal.com. Since there is never a fee unless we get results for you, there is nothing to lose by making the call. Haven’t you and your family suffered enough? Don’t you deserve proper legal representation to obtain and protect the workers’ compensation benefits to which you are entitled?